Educate! facilitates Miracle Corners of the World (MCW) Seminar in Zambia — Educate! | Preparing youth in Africa with the skills to succeed in today’s economy. In May 2011 Educate! 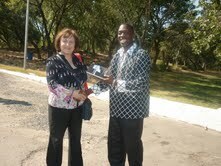 was contracted by Miracle Corners of the World (MCW) to facilitate its second community leaders seminar in Zambia. Educate! was represented by Mr. Solomon Kayiwa Mugambe, who facilitated the seminar focusing on two major themes: Business planning and Social Entrepreneurship. Miracle Corners of the World (MCW) organized the Second Community Leaders Seminar in the Zambian city of Kafue, 40 minutes south of Lusaka, from May 23-27, 2011. The event brought together the leadership of MCW’s community center network in Africa from Rwanda, Sierra Leone, Tanzania and Zambia to learn about MCW’s mission and operational approach and to develop workable solutions to some of the centers’ most pressing challenges. MCW Executive Director Eddie Bergman opened the seminar at ¡Revolución! Mexican restaurant in Lusaka. Also in attendance were MCW Trustees Kabinga Pande Jr and Andrew Chilufya, MCW board member Anna Condoulis, and MCW staff member Khalid Elachi. “For most of us, it was such an impressive moment to meet all community center leaders for the first time in one place and be able to recognize that we all share challenges which we will definitely turn into opportunities and solutions as long as our efforts are combined,” said MCW’s Country Coordinator in Rwanda Jackson Vugayabagabo. On the closing evening of the seminar, we took an evening cruise on the Kafue Queen river boat along the Kafue River where Ms Anna Condoulis presented Educate!’s first publication-Transform Uganda to all Country Coordinators to help them build on their knowledge of entrepreneurship, business and other lessons learned during the seminar. Educate! has a new office in Broomfield!